I found this on a bottle of Pret Orange Juice. 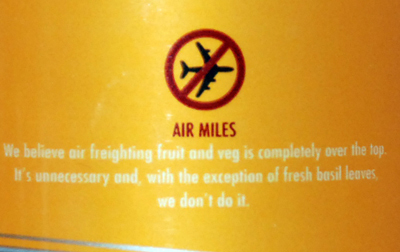 In case you can’t see the image: ‘We believe air freighting fruit and veg is completely over the top. It’s unnecessary and with the exception of fresh basil leaves, we don’t do it.’ – I hope this attitude catches on. This entry was posted on Monday, February 4th, 2008 at 21:27	and is filed under Uncategorized. You can follow any comments to this entry through the RSS 2.0 feed. Both comments and pings are currently closed. I have to admit that I never even thought about this.. Feedback nach 5 Minuten. Twitter sei Dank!